In 2015, an announcement was made signaling the entry of a new, large player in the 3D printing industry. 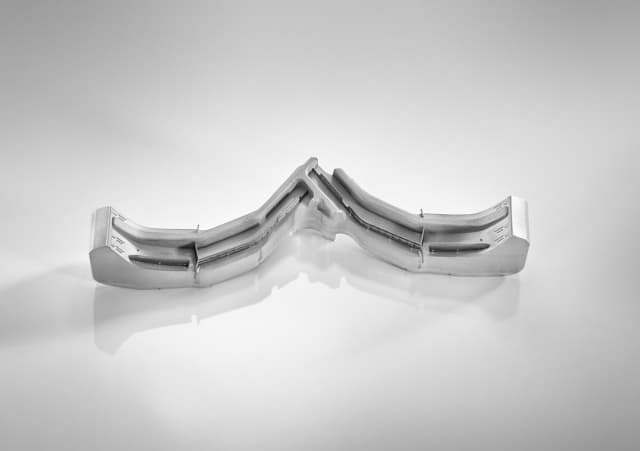 The Michelin Group and industrial engineering firm Fives launched a joint venture to develop metal 3D printing technology. When companies as notable as Michelin and Fives, which have been around for over 150 years, decide to enter the 3D printing industry, it signals that important changes are afoot in additive manufacturing (AM). By the end of 2016, the 50/50 joint venture, dubbed AddUp, unveiled its first metal AM system at form next in Germany. Now that the company is officially a player in the AM market, ENGINEERING.com reached out to AddUp's vice president of business development Vincent Ferreiro to learn more. The decision by a tire maker to become a metal 3D printer manufacturer may raise eyebrows. After all, making the leap from producing tires to producing advanced manufacturing equipment may seem like quite a big one. Ferreiro, who was previously in charge of strategy and partnerships at Michelin, explained that the company's decision to build AM systems actually came directly from making tires. Upon looking into AM further, Ferreiro said the company was able to determine that it was possible to create better tires, with such features as improved grip resistance. The next step was figuring out the cost structure related to 3D printing tire molds, as well as whether or not it was even feasible to mass produce tires using these molds, leading the company to purchase some AM systems and begin testing. Unfortunately, however, Michelin determined that the AM machines on the market were not capable of meeting those criteria and unable to produce parts with sufficient quality, accuracy and repeatability. In turn, Michelin began building its own technology inhouse. The tire giant then went onto use that technology to produce tire molds, according to Ferreiro. Over the course of the last three years, Ferreiro was involved in identifying new businesses outside of Michelin’s core tire manufacturing business, and 3D printing was determined to be of potentially very high value. Having designed and made a metal 3D printer inhouse, the company sought partners to commercialize it, Ferreiro said. Fives proved to be ideal, given its 166 years of experience in industrial engineering. 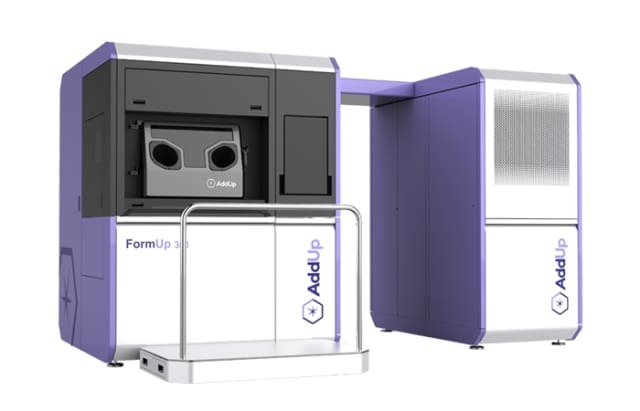 The first 3D printer to be released by AddUp is the FormUp 350, a powder bed fusion system described to have great quality control for industrial applications. With one or two 500W Yb fiber lasers, the machine has a build volume of 350 x 350 x 350 mm and can produce layer thicknesses as fine as 20 μm on maraging steel. Other materials currently compatible with the FormUp 350 are stainless steels, nickel alloys, Inconel 718, titanium alloys and aluminum alloys. According to the company, the FormUp 350 is designed to be capable of 24/7 operation and includes “unrivaled” surface quality, material integrity and internal stress levels and the ability to 3D print objects with very low angles relative to unsupported material, which minimizes the need for support structures and post-processing. Ferreiro pointed out that, for an added cost, customers can purchase advanced quality control mechanisms that include thermal monitoring, but he believes that the machines themselves are so capable of producing quality parts, that such mechanisms aren’t always necessary. The company also provides significant training and consulting services. In addition to a basic introduction to AM and its benefits, AddUp trains customers in the use and maintenance of its machines. More uniquely, the company will work with customers to conceptualize, design or redesign parts for AM. Customers who purchase the machine as a means of manufacturing goods for their own clients can turn to AddUp to help in meeting the manufacturing and economic requirements of a job. AddUp even helps its customers develop a roadmap for the technology, beginning with designs and creating a proof of concept to leading them into preserial production. As AddUp continues to grow, it will continue to develop its 3D printing technology. With a program dubbed SOFIA (“SOlutions pour la Fabrication Industrielle Additive métallique” or "Solutions for Industrial Metal Additive Manufacturing”), AddUp has planned a six-year research endeavor to develop the entire metal AM value chain, including powders, machines and processes. With a number of partners—Aubert & Duval, ESI Group, FUSIA, Michelin, Safran, VOLUM-E, Zodiac Aerospace, the French National Center for Scientific Research and a number of universities—AddUp will develop new technological modules that can be integrated into AM systems beginning in 2018. SOFIA will have a specific focus on the aerospace industry and will address 1) improving metal powder ranges, the productivity of the machines through material/process pairs and new energy sources, 2) designing new optimized parts and 3) increasing knowledge related to health and safety risks in metal AM. For drivers out there, that may mean better tires, but for the 3D printing industry, it could mean a potentially powerful player. Because Michelin has already implemented the technology to manufacture millions of metal parts, the quality of the machines may be just what the industry is looking for. To learn more about AddUp, visit the company website.